How To Let Go. How To Forgive Someone, Forgive Yourself and Why You Need To Do It NOW. Learning how to let go and how to forgive someone is essential to living at a higher level where you can experience happiness, freedom, and being in charge of your life. Why is it in your best interest to forgive and let go? Everything is energy. Our emotions are strings of energy vibrating at certain frequencies. If we feel angry, upset or unforgiving we are vibrating at a low energy and accordingly we feel heavy and drained in our body and soul. Often this is accompanied by sudden or chronic physical pain as unresolved negative emotions accumulates and clumps in the body. These energy blocks harm the natural flow of energy and prevent organs from functioning at there best. Many people believe that your health is associated only with your genetics and the food you eat. The truth is that your health issues and wellbeing are closely related to the EMOTIONS you feel on daily basis. If you feel good you allow the energy to flow freely. 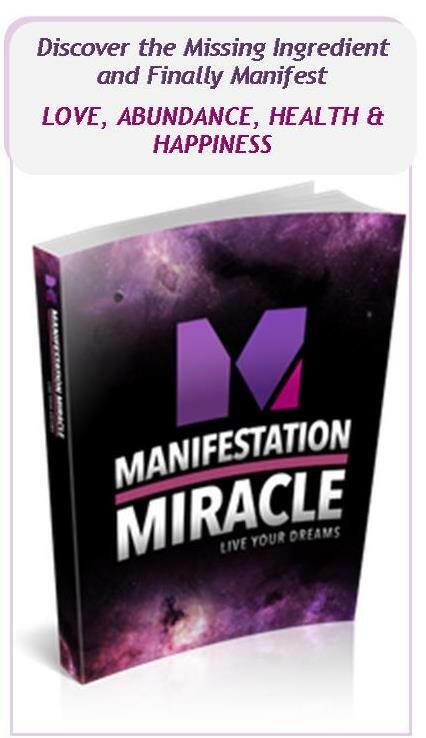 You also vibrate at a higher frequency and attract more things which you desire into your life. However, if you feel mostly negative emotions on a daily basis instead, you create blockages in your body that will eventually create pain or discomfort and harm your organs. You also vibrate at very different frequency which can only attract more of what you don't want into your life. For instance, according to Louis Hay, kidney stones are lumps of undissolved anger. Injuries such as cuts or wounds happen when you feel anger at the yourself and you are feeling guilty. Fat accumulation on your arms signifies anger at being denied love. Fat accumulation at your hips signifies lumps of stubborn anger at the parents. I would highly recommend reading Louise's book You Can Heal Your Life as it will show you the dangers of negative emotions and self talk and teach you how to let go and change your life. You can also practice our powerful How To Let Go Meditation that will help to literally locate, grab and remove negative these negative emotions out of your body and mind. As you can see if you don't forgive someone you are not hurting them but yourself. Forgive and Let Go ~ Set Yourself Free. As we explained, your thoughts and emotions translate into certain vibrations, feelings and actions. Dr David Hawkins helped us to understand the impact of our emotions in our everyday life with his Scale of Consciousness. 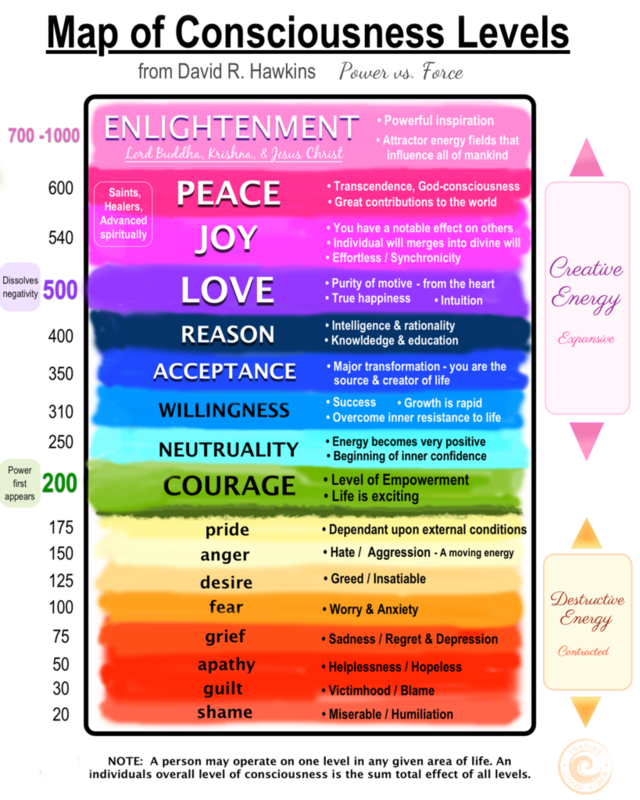 As you can see, feelings of anger and hatred are very low on the vibration scale. Feelings of guilt or shame are the lowest and most destructive emotions. How you feel on a daily basis can either help you to grow and attract more great things into your life, or your emotions can stop you from getting what you desire. Long term resistance often lead to physical pain and dis-ease. As you focus on negative thoughts you adopt "victim mentality" and attract even more things you don't want into your life by asking Why Me? You disempower yourself. Remember, we live in a vibrational Universe. It's not what you say that matters. We attract what we feel and think of most of the time. So if you hate someone, if you criticize yourself and others or if you think you are having bad life because of someone, having poor health because of someone or something, not having enough money, love, joy because of someone, feeling ashamed because of someone - those feelings make you vibrate at certain low frequencies which can attract only more of the same or similar emotions to your life. Always Remember: We live in a YES Universe. No matter what you choose to think or believe about yourself and others, the Universe will always say Yes to you. If you think you are not good enough Universe will say Yes to that. If you think you deserve only the best Universe will say Yes to that! For instance, if you think people are always criticizing and judging you - you are sending that vibration out which in turn attract same vibration back to you. Even people who are very nice and rarely judge or criticize anyone, will criticize you. You will literally draw this energy out of them. On the other side, if you will start to love and appreciate yourself and others, if you forgive and release you will attract more love, appreciation and happiness into your life. Watch your emotions, focus on positive, be grateful and your life will change. First of all, during your day whenever you start to focus on and start to feel negative emotions of hatred, anger and dislike toward the person you had conflicts with, imagine in your mind big red sign STOP. Associate this sign with awareness that you are creator of your thoughts, both negative and positive. 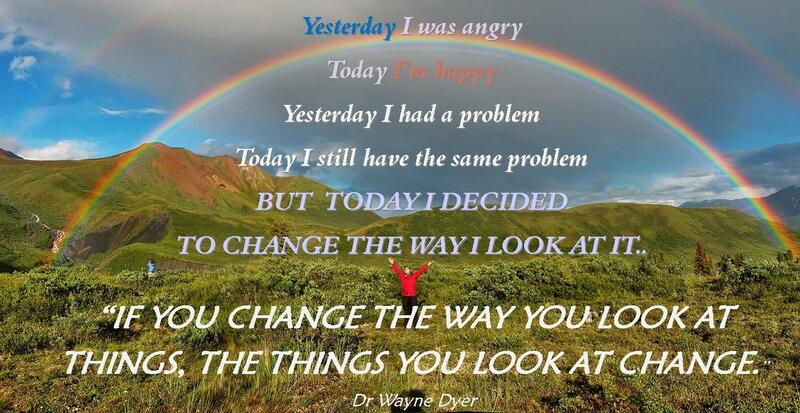 All thoughts CAN be changed. "Oh well, the voices are back again. I hear you saying - remember when this happened? Remember when that happened and how bad it made you feel? Remember, remember.."
For easier visualization you can imagine your voices to be loud monkeys, that only look to create anger, sadness and confusion in your mind. Or you can draw the picture of the entire negative situation on your imaginary board. Just acknowledge your voices and say something like: I show you exactly what happened dear voices and draw all people involved, angry faces and places on your imaginary board. Take anything that you feel inside out onto your imaginary board. Feel free to use any other images that work for you. Change your conversation with those voices. This time don't continue your old conversation with your voices, which only builds more anger and resentment. Instead reply to your voices: "Yes, I remember and SO WHAT ? My past does NOT equal my future. That was back then and this is now. I have learned, I have grown, I have changed since then. I'm a different person now. My past is over my dear voices. I am releasing my past now, I know how to let go and forgive. I'm allowing time to heal every area of my life. I now choose to fill my life with simple joy and I'm feeling better and better every day. I now choose to forgive and let go. My life gets better in every way. I love and appreciate myself. Thank your voices (don't fight them ) and send them away. "Oh, wonderful voices thank you for reminding me how much I've grown and what I can do NOW. I changed and I'm strong now. I realized that I am wonderful just as I am. I choose to focus on my strengths and blessings. I don't need you worrying about me and my past anymore. You can go back to your deep sleep. Thank you and good night. I let you go now." If you find it helpful, you can imagine your voices as two loud monkeys that are finally relieved and walking to their favorite place in your mind falling soundly and deeply asleep. Even if these are the most annoying and persistent monkeys you have ever met in your mind, understand and have compassion for them. They just care and want to protect you in only way THEY know how. They represent your EGO. Just let them go knowing you are now connected to your Higher Self and you now know how to let go, forgive and feel better. If you don't like monkeys or gremlins in your mind, you can simply imagine erasing negative images you drew on your imaginary board. See how the entire problem is just erased. You can do the same with your thoughts. You can simply CHANGE THEM. Once you have a clean imaginary board - feel starting all over. Draw image of forgiveness, letting go and happiness in your life. Write powerful words all over your board such as I'm wonderful, I'm enough, I let Go, I am Free, Compassion, Love, Forgiveness, Peace, Happiness, Joy on your imaginary board. After this meditation write those same words on piece of paper and keep it next to your mirror, bed, or wherever you can see it often in your home. Keep those images with you all day instead of negative ones. Slowly, you will let go of negative and heavy emotions and fill your mind with more positive and happy feelings that will bring new and happy moments into your daily life. Love and gratitude are ultimate healers and can transform low and stuck energies. You control your thoughts and emotions You create your life. When you Change your Thoughts and Emotions You Will - Change Your Focus - Change Your Story - Change Your Life. Don't allow to put yourself back into old feelings day after day. Thankfulness and Gratefulness is the antidote to hate, anger, fear and unhappiness. Start with strong emotions and mind every single morning. Make a simple change by using the power of Gratitude. Immediately after you wake up ask yourself these questions. They will transform the way you feel for the rest of your day and help you on your way of letting go, forgiving and healing. Who do I love and appreciate in my life? How does that make me feel? You need to answer these questions with your heart and feel it deeply. You need to activate this vibration within you. Words without feelings mean nothing. It's how you really feel or vibrate that matters or materializes. From this day on, focus on what are you thankful for. Find the opposite to what you are feeling and refocus on that. For instance if you are sitting in a traffic and feeling angry or upset notice these emotions and flash your STOP sign in your mind. Focus on something that will make your situation look better no matter what your current discomfort is. For example: How lucky am I sitting here in warmth of my car listening my favorite music. 100 years ago or living in some other country I would be most probably riding a horse or an old moped at best and I would be getting soaking wet in this cold rain. I'm so thankful and grateful for my car and getting home in comfort while listening to my favorite songs or educational CD's. Thank you, Thank you, Thank you! Start With Making A Decision To Let Go and Forgive To Yourself and To Others. When there is a will ~ there is a way! Make decisions to transform your life and let go off all unforgiving thoughts. Affirm daily as many time as needed until you feel change in the way you feel. Practice how to let go mediation daily for empowering results. When significant negative event happens in your life it will leave a mark in your energy. If you keep talking or thinking about this event again it re-activates your vibration and you will feel as if the event just happened all over again. Make conscious effort to focus less on your past event or person that you have a hard time to forgive. You also need to stop talking about it with your friends or family members over and over again, otherwise you keep reactivating it in your vibration as if it happened yesterday all over again. Problems need energy to exist. STOP feeding them and everything will resolve. The more you will clear it the less it will come back. Until one day you will completely let it go. Focus on what is well in your life. Be patient and trusting.